What’s in a name and all of the little things that I obsess about. 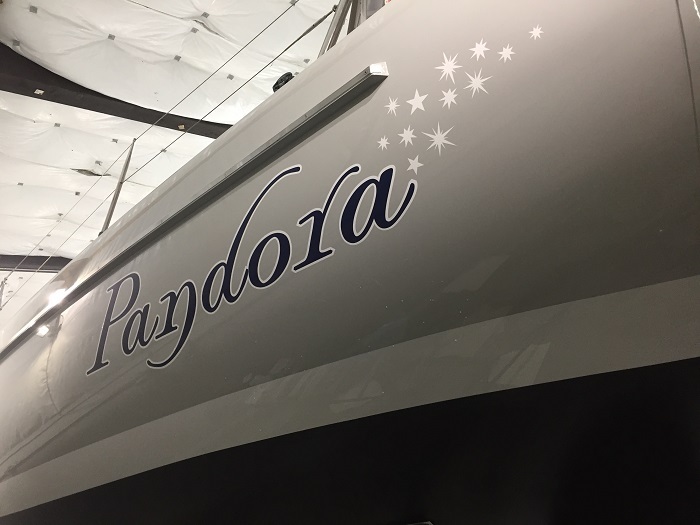 When people ask what our boat’s name is and I reply Pandora, my answer is often followed by another question. “Do you own Pandora Jewelry?” Another question is often “Do you work for Pandora Radio”, the Internet radio service. Nope and nope. At the time we owned Elektra, a Tartan 37, a great boat but one that did not have quite the “creature comforts” that Pandora affords and that I knew Brenda would require if I had any hope of her spending months at a time aboard. And, here we are so many years later with thousands of sea miles and countless nights aboard and I am still not sure if I should thank her or beg for forgiveness. Actually, it’s probably both. 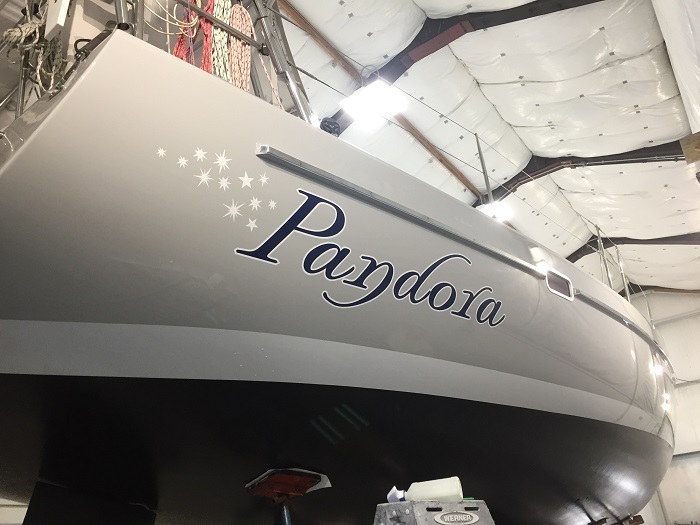 So, back to the newly painted Pandora all ready to hit the water in a few days. As with most important decisions, and plenty of minor ones, such as what sort of tile to use in a bath remodel, or what color to paint Pandora, I tend to obsess over such things. However, in my defense, after all the “what about this or that option?”, I generally feel like the outcome is worth the effort and Pandora’s new color was a decision that was worth obsessing over. Recall all the time that I spent choosing a color for Pandora? All those blog posts and Facebook posts about what color too choose? Well, I think it was worth it as her new light grey suits her perfectly. Folks had plenty to say about color choices ranging from “paint her the color of bird poop” to “exactly why are you asking total strangers what color to paint your boat?” However, the final outcome was definitely better for all the input so thanks for the help. In addition to the choice of color, which looks marvelous, I really wanted to get the logo perfect, both in design and in size. And, thanks to the work by Mike from Stamford Signs in CT, it really looks terrific. 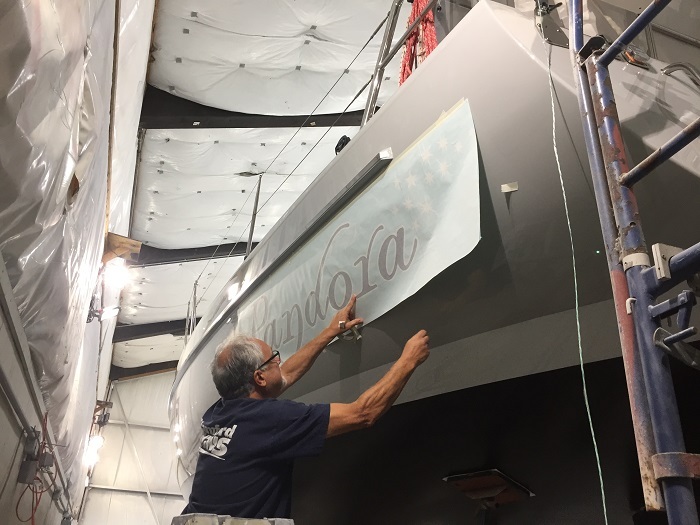 Mike was very patient and even offered to reprint the logo and make it bigger when we put the first printout on the hull a few days ago. We both agreed that it wasn’t quite big enough. Well, perhaps he was just humoring me but I appreciated his willingness to print out one that was about 1/3 larger, a whopping 7′ or perhaps longer. I think it looks just awesome. On the starboard side he switched the stars to the other end of the logo so that they would trail aft in both cases. My artist friend Chris had that idea and I think it was quite inspired. The process of actually applying the “sticker” was simpler than I would have expected. Mike sprayed a solution of water, alcohol and a bit of soap to the surface so that he could lift the vinyl if he got a wrinkle. No problem though, it went on perfectly, the first time. Nice work Mike. All done and now it’s time to put Pandora back in the water and bring her back to Deep River where her rig will be reinstalled, new rod rigging and all. There’s still plenty to do before I head south to Antigua at the end of October. And, speaking of graphics, I am now obsessing over what sort of decoration to put on my little truck. Of course, “TT (tender too) Pandora” is a great option. Or, perhaps “Pandora’s Box Truck”. Too obvious? Yeah, probably. For now, it gives me something else to obsess about. That’s good. 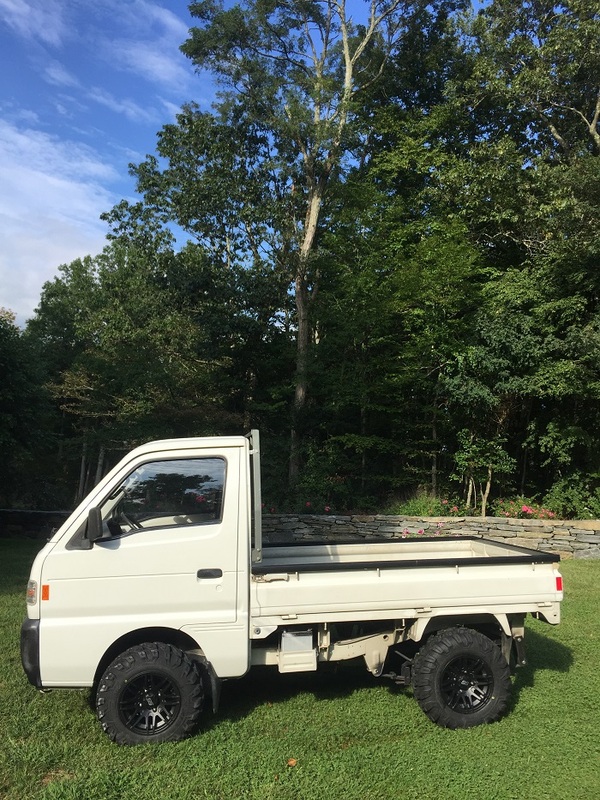 I think it’s a cute truck. Brenda says it’s just stupid. Don’t you just love the new “big” tires and wheels? Anyway, all this writing isn’t getting my other projects done and the plumber comes Tuesday to do the final hookups on the “new” bathroom that I have nearly finished. Best of all, we are heading to MD in a few days to see our three grandchildren and their parents too, of course. Our oldest Tori is getting older by the day. 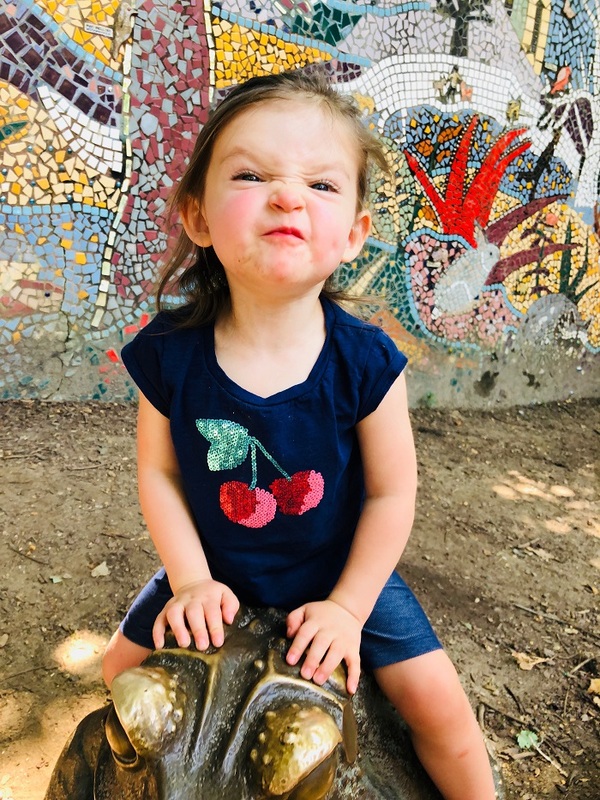 I just love this “sassy” picture of her. Yes, having grandchildren is wonderful and it’s the one little thing that I don’t obsess over. I’ll leave that to their parents. Why not name the truck Pandora’s Box? The new paint job and name look really nice, Bob. Good job! My wife’s response to the truck would be the same as Brenda’s. Some people, particularly wives, often don’t see the fun and potential in some things. How about naming the truck Pandora’s Pup. A connection to the boat name and an abbreviation of pickup? Another vote for Pandora’s Pup, but T/T works well also. What is the significance of the star cluster ? Yay, new blog post! That picture of Tori is melt-worthy! What a sassy pants. Pandora looks amazing, and I absolutely heart the story of how the name came about, never heard that story!